With the College Baseball World Series right around the corner, the last days of spring heat up as the NCAA Division I Men's Lacrosse Tournament enters its final phase. Though it is not coined the "Final Four" in Lacrosse, we are in fact, down to the last four teams. The tournament moves to Baltimore for the semifinals and Fanfare is thrilled to see both the Maryland Terrapins and the Duke Blue Devils have battled their way to this stage. The Blue Devils are no strangers to getting this far. With their quarterfinals victory over John Hopkins University, Duke has now made the semifinal for a remarkable eighth consecutive time. Needless to say we hope our two partners advance to the finals on Memorial Day. After that, we will wish both the best of luck and congratulations on a great 2014 season! FANFARE TRIVIA: Both Duke and Maryland have won two national titles in lacrosse. Which of the two has had the most Finals appearances? A Watch that will Impress Dad! Big, bold, and masculine, all sports fans love the Titan! Not just a casual accessory with your school logo on it, the Titan is an "in your face" statement of allegiance to your alma mater that commands attention. For the Titan, Suntime has constructed a new 44mm, solid stainless steel case that houses a billboard-sized presentation of your favorite school logo. The officially licensed image is precisely recreated using our PMS Spot Color pad printing process, then magnified by the Titan's scratch resistant, convex mineral crystal. Beneath the Titan's dial resides the quartz accurate Japanese Miyota movement with date function. The quality isn't confined to just the 5 ATM water resistant watch case. To keep the Titan secure to your wrist, Suntime added a superior quality watch band accented with a contrasting polished and brushed finish on each solid stainless steel link. The Titan's band exhibits an aesthetically clean transition from the monumental case to the elegant closure of the dual-button, inner deployment clasp. The Titan is a superlative timepiece designed to showcase your team spirit. Your school's logo is dramatically accented by the color-coordinated inner bezel with bold, phosphorescent primary indexes. Even the watch hands on the Titan allow easy readability without obstructing the image you champion. 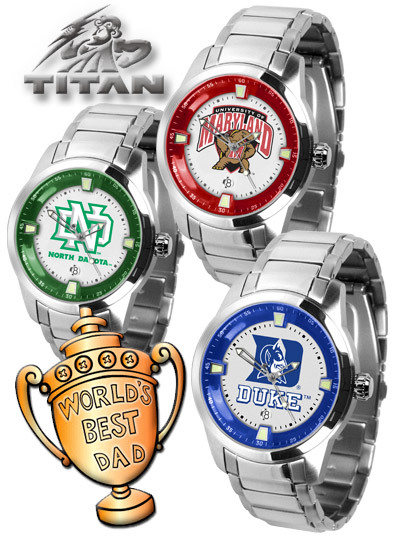 The Titan ... a big-time watch for the big-time fan. The Crosshairs divot tool has been created for both comfort and secure finger and thumb placement. The thumb fits comfortably on the handle at a perfect pivot angle to promote the correct forward 'pushing' motion. This creates optimal leverage to repair ball marks properly without damaging the green. The middle section is the same diameter as a golf ball. By placing the spherical portion of the divot tool on top of a golf ball, it can be utilized to draw lines on the golf ball. This helps with both putting and driving alignment. The top handle portion has a magnetic front that securely holds a removable ball marker. The magnetic ball marker can be easily removed with one hand by using the thumb and forefinger and placing pressure on the top part of the ball marker. The top part of the tool can be utilized as a club grip prop to keep club grips from getting wet. Push the prongs of the divot tool in the ground and prop the golf club grip on the top of the recessed portion of the divot tool. The Crosshairs divot tool can also be utilized as a club groove cleaner by placing the prongs of the divot tool inside the grooves of a golf club iron. For more information on this or other golf products call one of our sales representatives at 1-800-659-2824. Even the finest products with the highest detail and scrutiny are worthless if our customers never receive them. 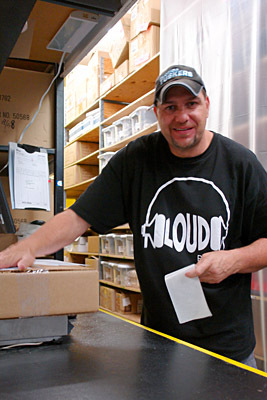 If you were to ask Joe Gutherie what he does, he would modestly answer, “I’m a shipping clerk.” We know he’s much more. Joe facilitates the location and preparation of Suntime and LinksWalker products. He fulfills sales orders and packs them safely to get to you. Often, Joe participates as part of the team that assembles our products specifically packaged for brick and mortar retailers. As longtime team member, Joe has started his tenth year with the company and possesses knowledge of our product line that is one of the most extensive in the building. For the job you do and the dependability you have proven over the years, we say, “Thanks Joe!" Joe Gutherie: A team effort goes into our product. Joe gets it to you!